1. To make the masala paste, heat oil in a pan. 3. Keep aside to cool and grind to a smooth paste with the remaining ingredients. 4. Mix the duck pieces with the ground masala paste and keep aside to marinate for 2 hours. 5. Pressure cook with 1 cup of water for 15 minutes. 6. Strain and reserve the stock. 8. Add the cooked duck and saute till brown. 10. Add onions and potatoes. 11. Fry till onions turn translucent. 12. Remove the onions and potatoes. Keep aside. 13. Reduce oil to 1 tblsp. 14. Add small onions and fry till brown. 15. Add the maida and mix well. 16. Add the duck pieces along with reserved onions, potatoes and stock. 17. Mix well and bring to a boil. 18. Simmer till potatoes are tender and gravy thickens. 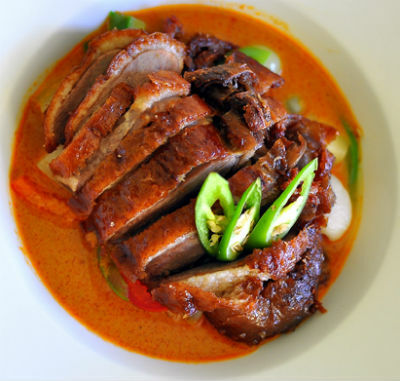 Feel free to comment or share your thoughts on this Spicy Duck Curry Recipe from Awesome Cuisine.